A friend of mine pointed me to an ongoing OpenStreetMap project in one of Africa’s largest slums on the outskirts of Nairobi, Kenya. “Kibera” is inhabited by hundreds of thousands of poor people; has hospitals, schools, and structure; and yet amazingly, according to project leaders and a 3 minutes long BBC mini-documentary/slideshow, Kiberia remains hidden from the world - designated as forest on government, Google, and other publicly available maps. Map Kibera is a project that was started in October 2009 by Erica Hagen and Mikel Maron (with initial funding by Jumpstart International). They advocate that, "without basic knowledge of the geography and resources of Kibera it is impossible to have an informed discussion on how to improve the lives of residents." When my friend contacted me with a link to this project, he said he thought I'd find it interesting but also told me he thought, "this is pretty different than what you're doing." Actually, I contend that this is very similar in many ways to what we are trying to do at Tutor/Mentor Connection (T/MC). The aforementioned BBC short film explains a bit more about why Map Kibera received funding necessary to staff volunteers and train 13 Kiberan youth in GPS/GIS and internet technologies needed to publish an interactive online map of their own community. The project leader interviewed in the film says, "Our motivation was, and our belief is, that without basic geographic knowledge of a certain place you cannot talk about improving people’s lives." "To enable people to have a bigger say in their futures," you need to "know how resources are distributed in a certain place – for example, how many schools there are… how many hospitals there are… how these hospitals are equipped… how much staff they have." "If you open up the information or data [to others], there is no saying what can be achieved out of this because a million people have a million ideas and a million things can happen." Tutor/Mentor Connection is working with a staff of three people and no real funding to try and accomplish a similar thing in Chicago's high-poverty neighborhoods. Are there a ton of differences between the poor of Chicago and the poor of Nairobi? Of course. But there are also many similarities. We aspire to take an inventory of all resources in our high-poverty, high-crime neighborhoods - using volunteers and empowering youth and citizens who live in the neighborhoods. Our goal is to encourage alliances and investment in student programs that improve at-risk students' lives, and in the long-term when these students grow up with their new skills through tutoring and mentoring, improve America. We have created an information hub of maps, data, strategies, and information, and are hoping there are "millions of people" out there with the talent and ideas to join us and make small investments of time and money to make something powerful like Map Kibera happen right here in Chicago. I found the wiki for the Map Kibera project particularly exciting, because it documents several of their challenges as well as the specific impacts their investment has made in Africa. Most of these are also very familiar to us here in Chicago at T/MC. They also point to the difficulty the community (you and me, as well as localized leaders and parents) has in "understanding the larger concept and benefits [of a resource map]," specifically pointing out the general limitation of what people assume maps can do. They report that many people initially did "not see how the map could benefit them or their community since it was only available online and they already knew how to get around." Additionally, even in Africa, there is results-based skepticism among the "average citizen [who] needed to see the results ... even if they were not able to access the Internet." This is especially frustrating when the map-makers inherently understand the technology but have difficulty "articulating the benefits and potential impact of the map at first." This is one of our biggest challenges and the purpose of this blog - to provide "many discussions, and more importantly demonstrations of the possibilities [of maps], to see comprehension of the potential for technology to bring real change" to our communities. Map Kibera also points to the challenge of trying to convince other related organizations (in our case, we are trying to build alliances of tutor/mentor programs - but also trying to encourage cooperation among faith-based and other theoretically like-minded groups like the Baptist community featured in the second map above - to join hands in support of at-risk youth). Map Kibera shares our frustration that "organizations do not like to share information ... There are so many organizations that they tend to see each other as competition. A collaborative spirit is hard to achieve, and it is not obvious to many why they would benefit from working together ... Every group was interested in having a map for their purposes; few have the sense of why an open and shared platform for everyone could be even better. The technology world has an ethos of creative collaboration alongside competition, in the spirit of innovation and problem solving. It is hoped that this concept will over time influence organizational behavior." Despite these challenges, hopefully the "impacts" that an organized, well-invested, map-based project like Map Kibera has had can open eyes to the wisdom of similar programs - such as T/MC in Chicago. Participants from Kibera, in their own words, according to the Map Kibera wiki, claim to have learned new technical skills, taken new-found pride, and obtained new social/advocacy skills that "may translate to other experiences and support their overall personal development," and could certainly lead to "leadership skills and [a new] sense of responsibility to the community." Tutor/Mentor Programs such as Cabrini Connections have clubs that teach tech skills as well as other media skills that can have these same effects. In fact, Mapping For Justice has worked closely with these clubs in the past and has even developed curricula designed to teach similar advocacy-through-mapping skills, if time and investment ever allows. In addition to the "personal impact" on participants, Map Kibera documented "community impact," such as bringing "the community closer to legitimacy and giving a sense of being a real neighborhood. Sensitive to external perceptions and its negative reputation, Kiberans appreciate any image such as this map that portrays it in a positive, or at least 'normal' light." Clearly one of our missions has been to supplement the negative news a ghettoized and beleaguered neighborhood like Englewood in Chicago receives, to encourage potential volunteers and business leaders to re-imagine the potential of these neighborhoods' wealth of talented students. Excitingly, Map Kibera's impact has lead to an increased number of organizations that are suddenly "keen to be represented and eager to learn how they can make use of the map as well as the [program] site to highlight their activities ... Groups that are interested in a variety of issues such as health, gender-based violence, sanitation, new mobile phone services, farm-to-market supply chain, large-scale conflict mapping, peace promotion, and others have contacted the directors to look into collaboration or use of collected data, sparking new thinking on each issue and the potential for the project to move in unexpected directions." This sort of community participation through the use of maps is the ultimate goal of T/MC's Mapping For Justice project. Thanks again to my friend who pointed me to the Map Kibera project. It has allowed me to reflect on similar goals, problems, and solutions we are facing right here in Chicago. Hopefully it has also opened the eyes of those who are curious and seeking "proof" that mapping can impact the ways organizations like T/MC can bring positive change to our communities. I think it’s time Chicago’s mentor program leadership got together and demanded some real investment by political leadership. With the coming mayoral elections on the horizon, the time is now. Bear with me as I explain. 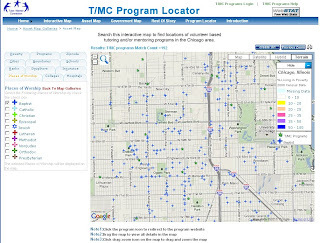 When I signed on three years ago as GIS Specialist for non-profit Tutor/Mentor Connection (T/MC), I was finishing my M.Ed and working in a Chicago Public School (CPS) on Chicago’s high-poverty, crime-riddled west side. I believe that the majority of CPS students I have met these past years are talented with academic upside (and if you don’t agree, I have to doubt you have actually met any of them). Unfortunately CPS students are often underprepared at an early age, in comparison to students I have worked with in “better” suburban schools. Many of them read at a lower grade level. Many do not have optimal parental support. The schools they attend are often poorly equipped in general. While this inequity itself is well-documented, it seems sometimes, no matter how much empirical research I cite, I struggle to guide the discussion away from finger pointing and toward an understanding that poverty (and the poorly-equipped students that are often raised in poverty) are everybody’s problem, no matter how far away from Chicago you move, or who is at fault. Across bipartisan lines, most would agree I think that underprepared students grow up to become adults that are underprepared to be workers, parents, and citizens. In worst-case scenarios, the costs of crime, prisons, and welfare affect taxpayers everywhere. So for me the question is, do we want to look for solutions to help at-risk students take care of themselves now, or do we prefer to have to take care of them later, with a continued cost of poverty? Here’s the good news, as I’ve come to learn: Contrary to what the media too often shows (and far too many people I talk to in casual conversation believe), many CPS students are actually... smart. As a teacher whose job was to provoke critical thought among inner-city social studies high school students who were often reading at an elementary level, I constantly marveled at how many of these students had creative, outside-the-box approaches to complex historical and civics-related problems. They often have the ideas but not the tools, if you will. Many of these same students are also willing to take on additional tutoring and commit to long-term mentors, when such opportunities present new tools, and new hope of a brighter future. Indeed, as a teacher then, and as a volunteer now, I continue to meet students with the initiative to enroll in optional school-based tutor programs like AVID, as well as non-school tutor/mentor programs like Cabrini Connections. That’s half the battle, right? Finding large numbers of at-risk students who are willing to take the extra step to receive supplemental academic and decision-making support, bridge the gaps they face in their development, and put themselves on paths to college and career, versus continued poverty? They’re out there, and I know for fact that mentoring programs can work. 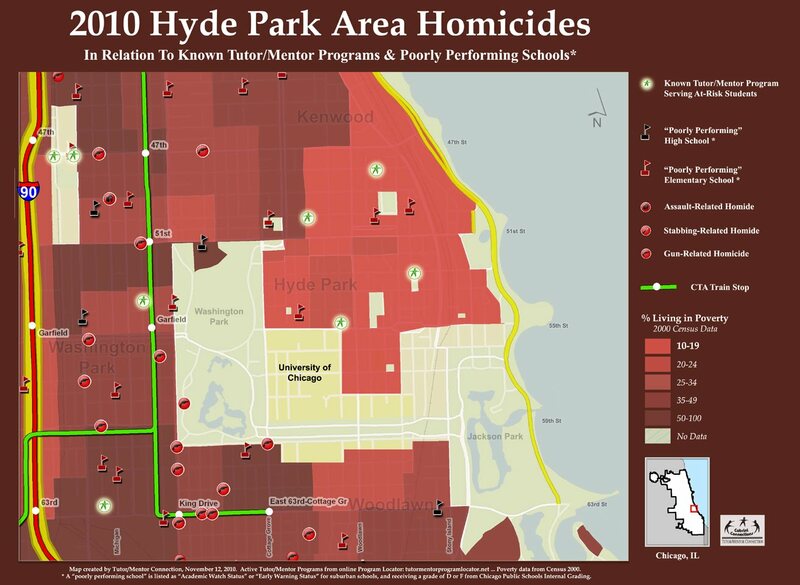 My personal stories aside, I recently wrote a blog that featured the story of Urban Prep Charter Academy for Young Men, a high school in the notorious Englewood neighborhood that employs full-time mentors, and in four years has put more than 2/3 of their incoming freshmen into four-year colleges, despite the fact most arrived reading at a sixth-grade level or below. But back to the point. Three years ago, I signed on at T/MC, a program that has been trying to organize resources that support mentoring programs and encourage new "Urban Prep"-like case studies in neighborhoods everywhere. 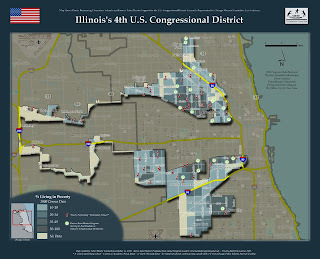 All I was being asked to do was use my skill as mapmaker and GIS professional to show how T/MC program data could be visualized – in map form – to the advantage of political, business, or other community leaders whose goals included safer communities, better schools, workforce development, and tax relief. I jumped at the chance to work with an organization that was trying to take the lead, organizing bi-annual conferences designed to bring mentor program leadership together, and stockpiling data and information in a centralized hub for these same leaders to use and share. To me, it all made so much sense. Help build it, I thought… and as sensible people, they would come. Well, three years later, politicians are still talking about crime and schools and workforce malaise. People are more freaked out than ever about crime and schools and workforce malaise. Reports continue to show that mentoring helps address crime and schools and workforce malaise. And yet somehow, there’s still little unity among the city’s mentor programs, and it’s still not fashionable for political leaders to include mentoring as a part of a proposed solution to the items on their agenda. For me, I continue to work in obscurity. And while I’m told by some to remain patient, I can’t help but lament that my efforts have been overlooked... with no indication this will change. After all, attendance figures at mentoring conferences I attend aren’t really soaring, we have seen a virtual freeze in donations and other investment in our technologies, and my web analytics tell me that very few people will probably even read this, honestly. But maybe that's just the nature of the blogosphere beast. Maybe I'm not really alone in any of this, and am instead just a single fractured voice, lost at sea trying to find others with similar concerns and ideas – others who are out there but are also failing to find a unifying force. Last week on Outside The Loop Radio, WLUW Chicago, host Mike Stephen interviewed Tom Tresser, an instructor at DePaul University and IIT, a former candidate for Cook County Board President, and a non-profit veteran since 1980. I felt a shiver of hope (misery loves company, I guess) when he pointed out that, while all non-profit sectors are suffering with familiar disunity and dwindling funding, NPOs do employ hundreds of thousands of workers in Chicago. In other words, they remain a vital source of employment and a potentially powerful constituency for a politician looking for votes. Unfortunately, we don’t have the unity, clout, or power at this point to take advantage of our numbers in the political arena, he says. We’ve seen how mentoring can help politicians. My recent blogs have cited issues our mayoral candidates are employing in their campaigns, and how mentoring can help them achieve their specific goals. So my question to the leadership at T/MC and mentoring programs everywhere is: Who is going to step up in the name of mentoring, and forge the politically powerful “vast constituency” Tresser insists is necessary to secure the ears and support of those in power; politicians who have the influence to make mentorship a fashionable component of any political platform, while encouraging volunteering, new leadership, and new investment in mentoring everywhere? This is the reason I got involved with T/MC in the first place – its mission is one of community and unity among program leaders everywhere, as evidenced by T/MC's commitment to their bi-annual conferences, and their mission “to help [programs] already operating, then help new programs form by borrowing from ideas of existing programs.” There’s is a clear commitment, from the top at T/MC, to the unification of mentoring leadership throughout the Chicago area. So who is going to step up? And by the way – for those leaders who are hoping Tresser backs up his call to action with an explanation of how this can work (after all, non-profits are forbidden by law to engage in politics directly), Tresser does lay out a strategy for working around this little hurdle, if anyone cares to read or listen about it. I signed on three years ago to make maps on a part time basis. I am a foot soldier in this war on poverty. Three years (of watching T/MC struggle) later, I impatiently wonder if an alliance of non-profit leadership can happen in time to influence this mayoral election. Or if it will ever happen. 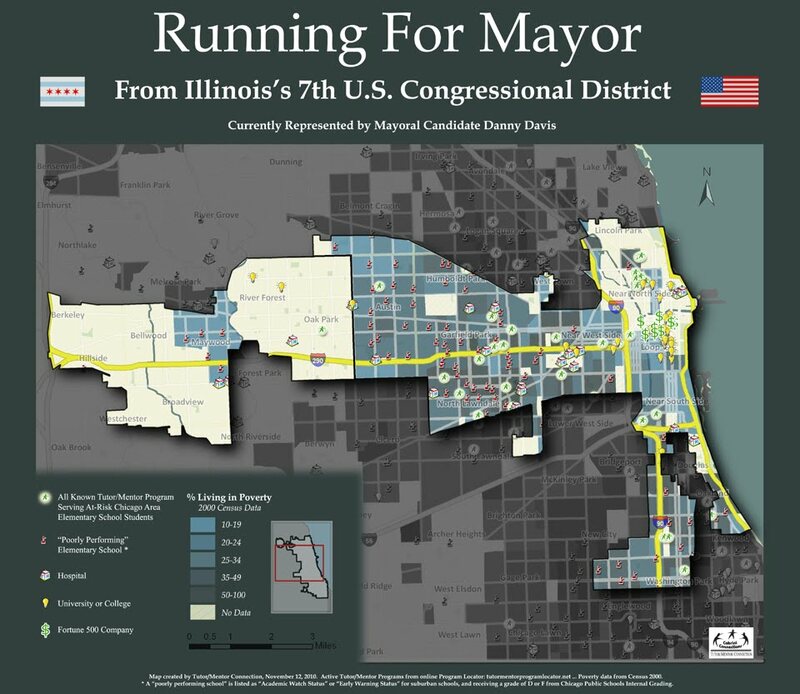 This past week, influential Chicago politician Luis Gutierrez, a US Representative whose district is featured on this first map (click to enlarge) came forward and endorsed Gery Chico in the race for Chicago’s next mayor. Lately, I’ve been publishing an series of maps that we at Tutor/Mentor Connection (T/MC) made, featuring political boundaries in Chicago. Of course, we at T/MC do not endorse specific candidates. 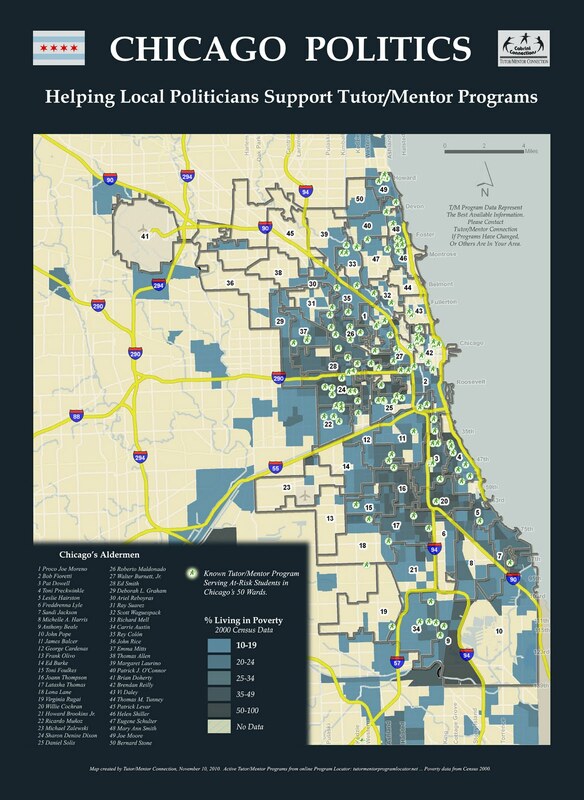 We simply wish to showcase how T/MC can customize a map to analyze the distribution of tutor/mentor services in any given region (in this case, a political district), and how we can also provide a birds-eye view of neighboring community assets for local leaders (in this case, for the next mayor of Chicago). We will also suggest, looking at each candidate’s personal platform and concerns (so far we have also looked at Carol Moseley Braun), that each candidate should have an interest in either supporting mentoring through direct action, or at the very least should be using their influence to tell their constituents how mentoring can supplement their efforts to address the issues they promise to tackle. This leadership might then steer other community leaders, volunteers, donors, and parents to these vital non-profit services in an economy where such services are at more risk than ever of disappearing. We have a database of over 200 tutor/mentor facilities that are already in place, working toward this same goal, and I have written on this blog about how mentoring can bolster our workforce by helping students choose books and careers over less desirable paths. On education, Chico states that, “without an effective school system we cannot prepare kids to compete in the global economy, or provide the labor force that will attract good companies to locate in our great city.” His “Ready by Five” initiative seeks to ensure that “every child is prepared to learn and succeed by the time he or she reaches kindergarten.” He also wants to “create a Parent Academy for every school” that will help parents who “lack the resources and knowledge to effectively help their children succeed” learn those skils. These are great ideas that can be supplemented by mentor-student relationships that help kids who are "ready by five" stay the course toward globally competitive careers, while helping these same young adults achieve the academic and vocational success that will support their ability as the next generation of parents to effectively help their children succeed as well. On the issue of crime and safety, Chico lists several ways he might make schools themselves safer, but I suspect he might also be interested in learning how a mentoring program in a high-crime neighborhood like Englewood could help its young men stay out of trouble, graduate, and enroll in four-year colleges at an unprecedented rate. He might then explore how similar mentoring programs might improve the well-being of students (and adults) in every neighborhood. Chico is an advocate of community-level “partnerships that can enhance our children’s education” and promises to "partner with foundations, community groups, museums, government institutions, etc. to bring innovative and diverse programs and learning opportunities to our schools." Perhaps he and the other candidates - whether they become mayor or not - are already exploring how partnerships with established mentoring programs can supplement their efforts to achieve their vision of a prosperous, safe, and educated Chicago. U.S. Congressman Danny Davis and Reverend Senator James Meeks have pulled out of Chicago’s mayor’s race, and are now endorsing Carol Moseley Braun, in the upcoming battle for Chicago’s top boss. Their collective battle cry revolves around “unity.” I can only hope "unity" is a policy-related concept, as much as it may be useful in consolidating votes. 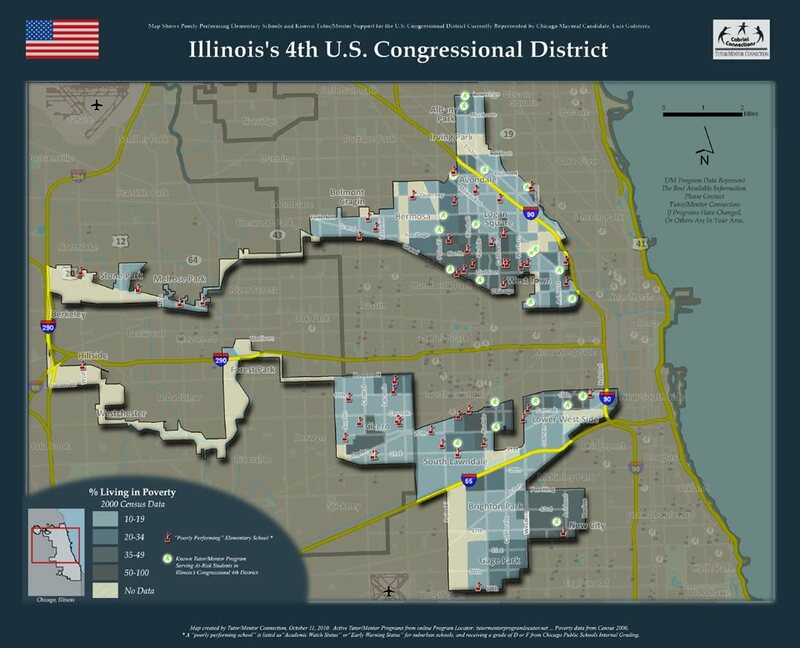 At our map gallery in November, we featured maps that provide birds-eye views of Congressman Davis’s district, as well as Senator Meeks’s district, in an attempt to show how Tutor/Mentor Connection (T/MC) maps could help Chicago’s next mayor -whomever it may be - become better equipped to address voter concerns such as education, crime, and economic challenges. Carol Moseley Braun, as Chicago’s next mayor, would obviously face the same challenges as Davis and Meeks. 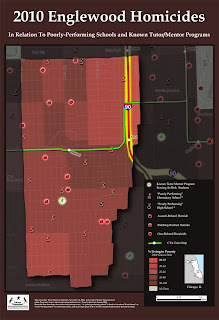 Using a map similar to the Davis map above (click to enlarge), she too might visualize where businesses and other community resources such as hospitals and colleges are operating, in relation to poverty and existing support systems for at-risk youth (such as tutor/mentor facilities). She could then allocate resources, or facilitate unity among community leaders, as she sees necessary. She might also notice where highways cut through the city, in relation to poverty and poorly-performing schools, and perhaps encourage commuters interested in "service" to become active in student-focused programs, thereby uniting volunteers from relative wealth and success with intercity youth who might not otherwise have mentors in their lives that can provide strong career paths. 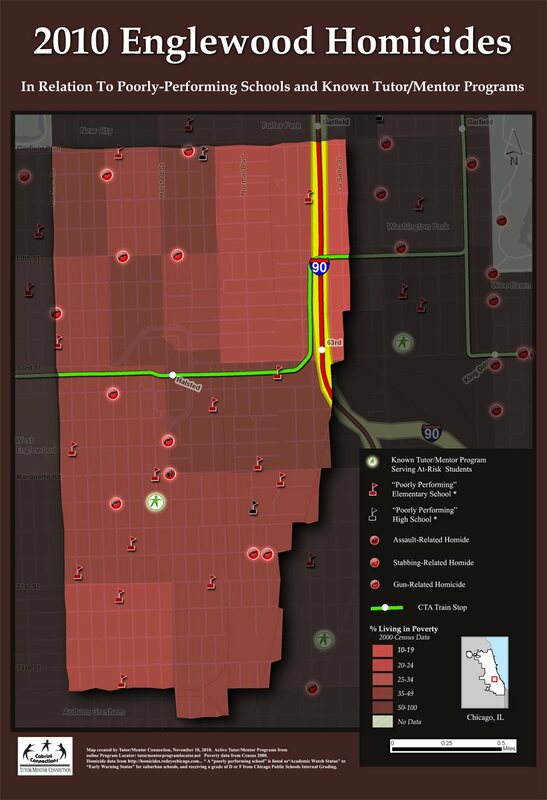 Like Meeks, Braun might use maps to visualize and unite our faith community, in areas where students live, and then build tutor/mentor facilities to help local youth onto paths that lead to college and career, versus welfare and crime. As a long-time resident of Hyde Park, an island of academic and business wealth in an area of the south side of Chicago that is relatively impoverished and crime-ridden, she has first-hand concerns that the recently reported drop in violence might be misleading, and reminds us that crime is still a serious problem, before offering a message of hope, that violent crime “is not insurmountable. This is something we can do something about." She cites mentoring programs as part of the solution. Perhaps she is using maps to help her visualize where these mentoring programs might be needed most. And then uniting resources the maps show are available to help build great programs all over the city.